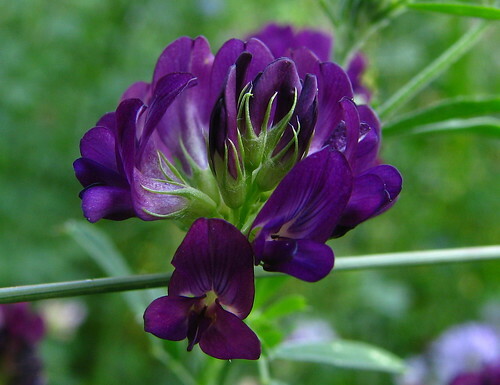 Alfalfa Flower. How can this Beautiful Plant be so Harmful? When I read the Environmental Leader’s recent article about the USDA’s decision to plow the way for the planting of genetically modified alfalfa, I was pissed. My nice girl attitude gloves came off and I thought of nasty names to call the USDA (Monsanto’s b-tch. Monsanto’s Mistress, etc.) When can genetically modified anything be good when the jury is still out on its environmental impact? But maybe I just don’t get it. Maybe, our cows needs to eat GM alfalfa which turns into GM beef and GM milk. And maybe the GM crops won’t have an effect on our organic crops? Sure. I have a bridge to sell you in Brooklyn. Why is Genetically Modified Alfalfa so Bad for the Environment? A year ago, I urged you all to sign a petition telling the USDA to take off the rose colored glasses and deny Monsanto the right to sell genetically modified seeds that could withstand their product, Round-up. (And by the way, just in case you don’t know, Monsanto makes Round-up.) Why? Alfalfa is the fourth largest crop, in terms of acreage, grown in the United States behind corn, soybeans, and wheat. It is a perennial forage crop, so that it will live for many seasons. Cows that eat alfalfa produce good beef and therefore a better price. There is uncertainties as to the long term ecological consequences of the use of GE modified crops. A study suggested that planting GE modified potatoes causes changes in the bacteria in the soil. The Saddest Part. Big Food Industry Triumphs. How did this mayhem happen? Didn’t our President’s wife supervise the planting of a huge organic garden? So what is good for the White House staff isn’t good for the rest of the US? The Obama Administration decided last month that it would weed out government proposals that are overly burdensome to businesses. According to a recent Wall Street article, the Administration trumps the USDA. In turn, Agriculture Secretary Tom Vilsack’s decided not to regulate genetically modified alfalfa seed despite his open letter to stakeholders where he was optimistic that there could be co-existance of genetically and non-genetically modified seed use. The USDA received 200,000 comments from people who were critical of genetically modified alfalfa and conclusion reached by the USDA’s EIS. In light of Vilsack’s wish to meet a middle ground, the USDA considered three options on the GE alfalfa: continued regulation, deregulation, or partial deregulation with established measures to insure cross contamination would not occur between conventional GE crops and organic crops. Is the Handwriting on the Wall for Organics? The USDA seems to be taking a very obvious stance with their non-regulation of GM alfalfa as well as their establishment of the bio-preferred product certification to commence in February 21, 2011. According to USDA Biopreferred site, the purpose of the program is to increase the purchase and use of bioproducts to reduce our country’s carbon footprint. Federal agencies and contractors are required to give preferences to biobased products where the purchase price of an item exceeds $10,000 or the collective fiscal costs of an item exceed $10,000. The agency has clearly forgotten about the other environmental implications associated with the bio-tech industry which includes using products containing genetically modified materials. How can organic farmers seek certification for their products when there could be cross pollination from deregulated GE alfalfa? Think about it. How can a farmer certify that his beef is organic? Or his cows’ milk? How would a farmer know if his cows ate genetically modified alfalfa? What about the cost of organics? A farmer will have to source or plant a different foraging crop which may cause the cost of organic milk and beef to increase. Will organic dairy and meat farmers be squeezed out of business? The Center for Food Safety will institute suit regarding this decision. What can you do? Make a donation to help the legal effort. Let the White House know that you are mad as heck, and want your food protected. I sent my email today. Maybe next time, Mr President, ask what would Michele do? Everyone’s opinion counts here. You are welcomed to agree or disagree with me. Just be polite. What are your thoughts about the Administration trumping the USDA? What do you think about the future of Organics? What do you think will be the outcome of the Center for Food Safety’s fight? This is a terrible decision. In a few years the government will be moaning about the damage to organics and wondering what could possibly have happened. By that time Vilsack will be working in another industry job. If there were any justice in the world, Vilsack and Monsanto executives would have to spend a year on a farm receiving aerial spraying of Roundup. Anyway, enough ranting. I signed up for the Food Safety email list and sent an email to the White House. I always feel I should write a letter on paper; don’t know if those are still counted as representing more people. I hate to make phone calls, though. Thanks for the link to the Organic Trade Association. Just sent them an email. Hope everyone who reads this will do the same. Alexandra, the more people we spread the news about why GMO alfalfa is so bad, the better. More people will be outraged and take action such as backing the emailing campaign. Share my post and the campaign on FB and twitter and ask all of your friends to do the same. I have only recently stepped into the Monsanto conversation. I’M OUTRAGED!!! Talk About A Wolf In Sheep’s Clothing. It would be my pleasure to send an email! Vanissa, thanks for reading the conversation and feeling outraged. The more people we tell, the more people will share your outrage. Please spread the word via Facebook and Twitter to sign this email campaign. Given the amount of people who are upset, I bet there will be more mobilized campaigns to stop Monsanto. I will report it as soon as I know. Sadly, Ireland have also backed down over their GM plans yesterday, by doing a u-turn and allowing GM products to re-enter the market.